임진왜란(1592)과 병자호란(1636)을 겪은 후 잇따른 외침에 대비하기 위해서 세워진 성이다. 성은 내성·중성·외성을 각각 다른 시기에 쌓았고, 성 안에는 별장을 두어 항상 수호케 하였다. 하양, 신령, 의흥, 의성, 군위의 군영과 군량이 이 성에 속하며 칠곡도호부도 이 산성내에 있었다. 내성은 인조 18년(1640)에 관찰사 이명웅의 건의로 쌓았으며, 칠곡도호부가 이 안에 있었다. 중성은 영조 17년(1741)에 관찰사 정익하가 왕명을 받아 쌓은 것으로 방어를 위한 군사적 목적이 크다. 중요시설은 내성 안에 있으며, 중성에는 4개 고을의 창고가 있어 비축미를 보관해서 유사시에 사용하게 하였다. 외성은 숙종 26년(1700)에 왕명에 의해서 쌓았다. 성은 외성 남문으로 들어가게 되고, 성의 주변에는 송림사를 비롯한 신라때 절터가 많이 남아있다. 1960년의 집중 폭우로 문 윗쪽의 무지개처럼 굽은 홍예문이 파손되고 성벽의 일부가 없어졌으나 그 밖에는 원형대로 보존되어 있다. 가산산성은 험한 자연지세를 이용한 조선 후기의 축성기법을 잘 보여주고 있는 대표적인 산성이다. This fortress was constructed for the purpose of national defense against foreign attacks following two consecutive wars, the Japanese invasion of Korea in 1592 and the Manchu invasion in 1636. The fortress has the triple structure with fortifications on the inside, the outside, and in the middle. It took so long to finish the construction of the whole structures, because each layer of the three walls was built one by one, not at the same time. Joseon kings always appointed a military officer to the office of governor-general responsible for this region in order to maintain absolute security. They exercised control over all army communications, supplies including military materiel and rice, and military camps in the districts of Hayang, Sillyeong, Uiheung, Uiseong, and Gunwi, as well as a corps called Chilgok Dohobu, a force that was stationed in this fortress. 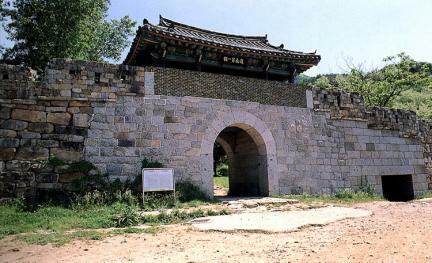 The interior fortress was built at the proposal of Yi Myeong-ung, a provincial governor called Gwanchalsa, to King Injo in the 18th year of his reign (1640), a time when the special force Chilgok Dohobu was already stationed there. 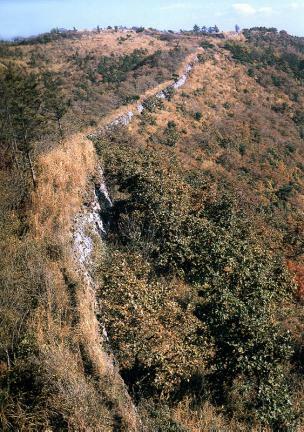 The middle one was put up at King Yeongjo's indication to a provincial governor, Jeong Ik-ha, in 1741, the 17th year of his reign to defend the area effectively against any enemy attacks. There were warehouses of the four villages in the middle fortress to take charge of emergency rice especially for effective supply at a time of crisis. The exterior walls were erected by order of King Sukjong in 1700, the 26th year of his reign. 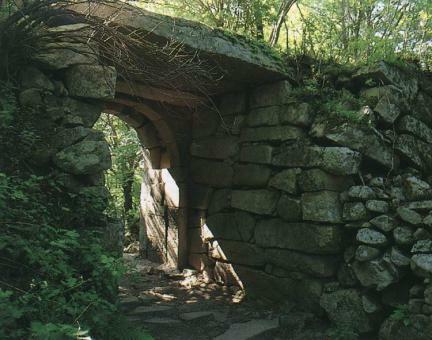 The entrance to the fortress is the south gate of the exterior wall. 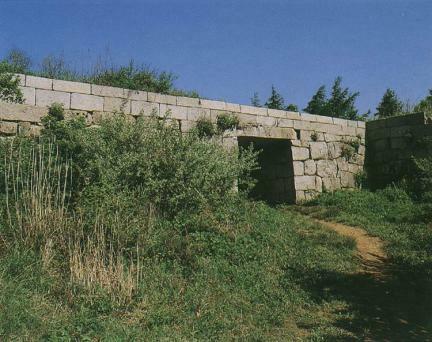 There are lots of Buddhist temple sites around the fortress including Songnimsa, established in the Silla Period. Torrential rain in 1960 caused damage to Hongyemun Arch at the top, and a portion of the wall disappeared, but apart from that, the entirely original appearance is very well maintained. 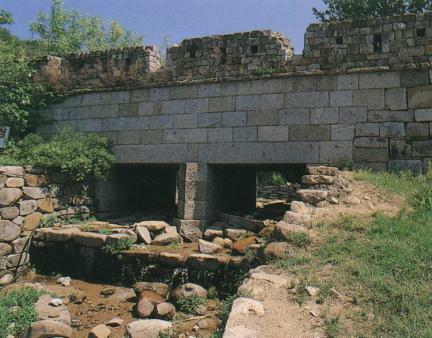 This fortress is regarded as a representative example showing the mode and technology of fortifications in the late Joseon Dynasty, mainly utilizing the natural configuration of the land and its topography.